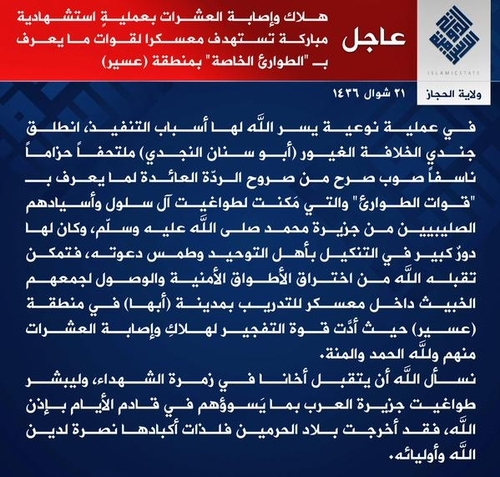 Today claiming a 'Wilayat al-Hejaz' (referring to the western part of Saudi Arabia), as opposed to previous attacks in the country and in Kuwait under the guise of Wilayat al-Najd (referring to the north/central desert area). Translation of the statement below, which is also notable for the threat of attacks in the imminent future, apparently using more Saudi operatives. "Breaking: killing and wounding of dozens in a blessed martyrdom operation targeting a camp for the forces known as 'Special Emergency' in Asir area. In a special operation whose means of implementation God facilitated, the zealous soldier of the Caliphate (Abu Sinan al-Najdi) headed for one of the structures of apostasy belonging to what is known as the 'Emergency Forces' that have also given power to the tyrants of Al Salul [pejorative for the Saudi royal family] and their Crusader masters over the Peninsula of Muhammad (God's peace and blessings upon him) [i.e. Arabian Peninsula], and have had a great role in maltreatment of the people of tawheed [monotheism] and obliterating their da'wa [proselytising]. So he- may God accept him- was able to penetrate through the security circles and reach the evil gathering of them inside the camp for training in the town of Abha in the Asir region, while the force of the explosion led to the killing and wounding of dozens of them- praise and blessings be to God. We ask God to accept him in the group of martyrs, and to convey to the tyrants of the Arabian Peninsula of what evil will inflict them in the coming days by God's permission, for Bilad al-Haramain [the land of the two sanctuaries in Mecca and Medina- i.e. Saudi Arabia] has brought out pieces of its livers in support of God's religion and His allies."